Central Texas single-family home sales growth slowed in the first half of 2017 while home prices continued to grow at a steady pace, according to the Mid-Year 2017 Central Texas Housing Market Report released today by the Austin Board of REALTORS®. Single-family home sales in the five-county Austin-Round Rock MSA rose 2.8 percent year-over-year to 14,958 home sales in the first half of 2017, while the median price rose 6.4 percent year-over-year to $300,000. Home listings also experienced gains in the first half of the year, with active listings jumping 15 percent to 6,153 listings, new listings rising 9.0 percent to 22,293 listings, and pending sales rising 3.5 percent to 16,665 sales. Sales dollar volume in the Austin-Round Rock area was $5,618,721,669, a 10.4 percent increase from the first six months of 2016. Single-family housing market activity maintained steady growth in June 2017, with home sales volume increasing 4.4 percent year-over-year to 3,415 sales. The median price rose 6.6 percent to $314,000 during the same time frame. Monthly housing inventory jumped 0.5 months annually to 3.1 months, which is just under half of the Real Estate Center at Texas A&M University’s benchmark of 6.5 months as a balanced housing market. Single-family home sales in the city of Austin increased 4.3 percent to 4,680 home sales in the first half of 2017. Of the 22,449 single-family homes sold in the 18-county Central Texas region in the first half of the year, approximately only one in five (20.8 percent) were sold within the Austin city limits. The median price increased 7.7 percent to $365,000 in the first half of the year, while active listings increased 8.7 percent to 1,435 listings during the same time frame. In June 2017, Austin home sales edged up 2.1 percent to 1,015 home sales, while median price jumped 13.2 percent to $393,500 during the same time frame. Housing inventory increased 0.1 months to 2.4 months of inventory, while homes spent an average of 36 on the market, an increase of two days from June 2016. In the first half of 2017, Travis County single-family home sales increased 2.2 percent year-over-year to 7,388 home sales – nearly half of all single-family homes sold in the five-county MSA during the same time frame. In the meantime, the median price increased 6.6 percent year-over-year to $351,804. In June 2017, single-family home sales increased 5.2 percent to 1,669 home sales, the median price rose 7.1 percent to $375,000, and monthly housing inventory grew 0.3 months to 3.1 months of inventory. Williamson County single-family home sales remained flat in June 2017, declining 0.1 percent year-over-year to 1,167 home sales. The median price rose 5.9 percent to $286,000 during the same time frame. Housing inventory jumped 0.7 months to 2.9 months of inventory in June 2017, which is the lowest housing inventory level of any county in the Austin-Round Rock MSA. In the first half of 2016, single-family home sales grew 1.2 percent to 5,067 home sales, while the median price rose 6.2 percent to $276,000. 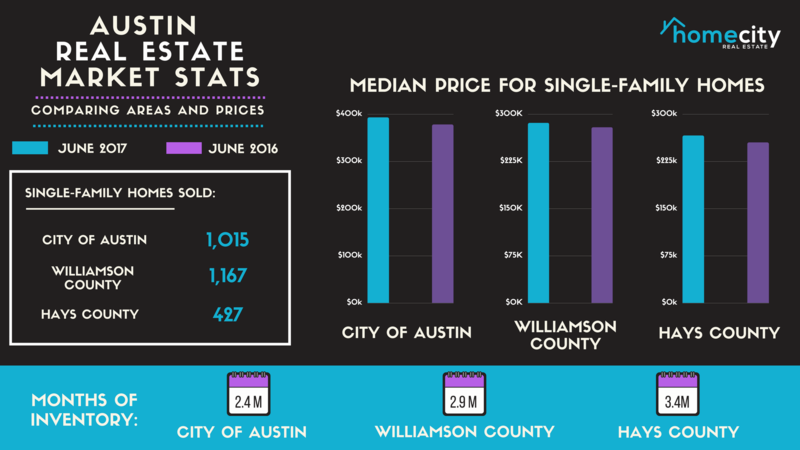 More homes were sold in Williamson County in the first half of the year than in the city of Austin – despite having less than half the population size of the city of Austin – as strong housing development throughout Williamson County continues to drive sales activity. Active listings soared 23.8 percent in the first half of the year to 1,958 listings, while new listings increased 11.8 percent to 7,407 listings. “Williamson County’s housing market growth continues to be stifled by incredibly strong demand coupled with low housing inventory levels. While Williamson County’s housing inventory is slowly recuperating from the critical levels reached in 2016, the county’s housing inventory remains among the lowest in the region,” commented Guthrie. In the first half of 2017, Hays County single-family home sales rose 7.3 percent year-over-year to 1,799 home sales, while the median price increased 5.7 percent year-over-year to $256,509. As a result of strong housing development and sales activity throughout the county, new listings increased 12.3 percent year-over-year to 2,678 listings, and active listings jumped 16 percent year-over-year to 856 listings in the first half of the year. In June 2017, single-family home sales jumped 14.5 percent year-over-year to 427 home sales, while the median price increased 6.7 percent to $266,250 during the same time frame.